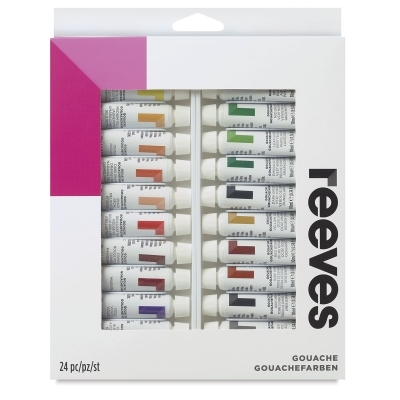 Gouache is an opaque watercolor that isideal for use on a variety of surfaces. Colors are packaged in 12 ml (0.4 oz) tubes. Reeves Gouache conforms to ASTM D 4236 and is non-toxic. This set contains 24, 10 ml tubes including White, Lemon Yellow, Medium Yellow, Orange Yellow, Orange Red, Flesh Tint, Magenta, Brilliant Red, Crimson, Violet, Cobalt Blue, Blue Lake, Ultramarine, Prussian Blue, Mid Green, Leaf Green, Emerald, Dark Green, Yellow Ochre, Red Ochre, Burnt Sienna, Burnt Umber, Grey, and Black.